Accounting forms are used to keep track of any financial transaction within a company. It is important to maintain a strict rule for handling this form as any kind of mistake can be dangerous for a company or an organization. Accuracy is the key factor to record all important information in this form. 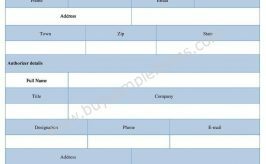 Generally, this form helps to identify the fields where the investments are made by the company, and then a profit and loss statement is designed by analyzing this form. This form is very helpful for any company as it improves the financial condition of a company or at least giving a way towards the profit. The content of the form varies with the purpose as a company follows many types of accounting forms to keep track of the different fields. Basic accounting form records data regarding any kind of business transaction made by the company within a certain financial year. A company can use a petty cash form that is important to keep data of depositing and withdrawal of money from the petty cash box. Journal or purchase order forms are maintained to record the expenses of a company for the journal and purchases. This form needs to be handled with accuracy as it looks after the finance department of the concerned company.